The stub-nosed Cygnet will be Aston Martin's slowest car. LONDON -- To broaden its appeal and boost revenue, Aston Martin is departing from tradition with a city car based on Toyota's iQ subcompact. The British luxury sports car maker says the Cygnet's hand-stitched leather interiors and Aston Martin badge on the grill will persuade customers to pay 30,995 pounds ($50,500) for the model. The Cygnet's price is more than double that of Toyota's iQ, which provides the engine, transmission and frame. Aston Martin aims to sell 1,500 Cygnets a year, which would make it the company's second-best seller after the V8 Vantage's annual deliveries of about 2,000. Overall, the brand's sales in 2010 gained about 6 percent to 4,250 cars, spokesman Kevin Watters said. Chief designer Marek Reichman said the Cygnet is a luxury city car. "Prior to Cygnet your choice was, you open the door and it smells of plastic; now you open the door, and you'll be hit by this wonderful smell of leather," he said. Aston Martin relied on Toyota to cut the cost and time for building the Cygnet in a unique project with the Japanese carmaker. The ultra-luxury carmaker, which unlike rivals isn't backed by a larger auto manufacturer, developed the model in about 12 months, compared with the typical three-year timeframe for most car projects. Environmental pressure and growing city populations have prompted luxury car makers to tailor offerings for urban drivers. Audi introduced the A1 subcompact last year. BMW will introduce an electric-powered city car in 2013. Mercedes-Benz later this year will start selling a revamped B-class compact, the first in a line of four new small cars. Aston Martin has to meet these demands on its own. The company hasn't had the backing of an automotive parent since Ford Motor Co. sold the carmaker to a group of investors including Investment Dar for 479 million pounds in 2007. Lamborghini, Bentley and Bugatti are owned by VW, while Fiat SpA controls Ferrari and Maserati. That solitary status may have pushed Aston Martin too far in the effort to reach new customers, said Simon Empson, managing director of U.K. discount car website Broadspeed.com. "I have no idea who would buy an Aston iQ or why they would even want one -- it looks just daft," said Empson, who previously owned the Aston Martin DB5 featured in The Italian Job film. "Extending the brand is all well and good -- fitted luggage and sunglasses I get -- but city cars I just don't." Cygnet buyers will get a leather interior made from seven cow hides, the same amount used in the 125,000-pound DB9 sports car, Reichmann said. Aston Martin will offer six types of alloy wheels and as many as 3 million possible combinations of trim and color options. A navigation system, six-speaker stereo and leather-clad steering wheel and gear shift are standard. The luxury doesn't extend beneath the hood, with the car's 97-horsepower engine essentially unchanged from the Toyota iQ, which starts at about 12,500 pounds. The Cygnet accelerates to 100 kilometers (62 miles) per hour in about 11.6 seconds, compared to 3.7 seconds for the 750-horsepower One-77. The Cygnet, which goes on sale in June, will be Aston Martin's slowest car. The four-seat, stub-nose compact will rely more on fuel efficiency and practicality to win over buyers than the speed of its other models such as the 176,000-pound ($285,000) DBS, James Bond's latest ride. "It's not about 0 to 60 speeds, or road holding or handling, or great racing capabilities," Reichman during a test drive in London. "In the city, space is far more at a premium. You've got fewer chances to park, far more congestion, so it makes sense that our customers have a small luxurious product." 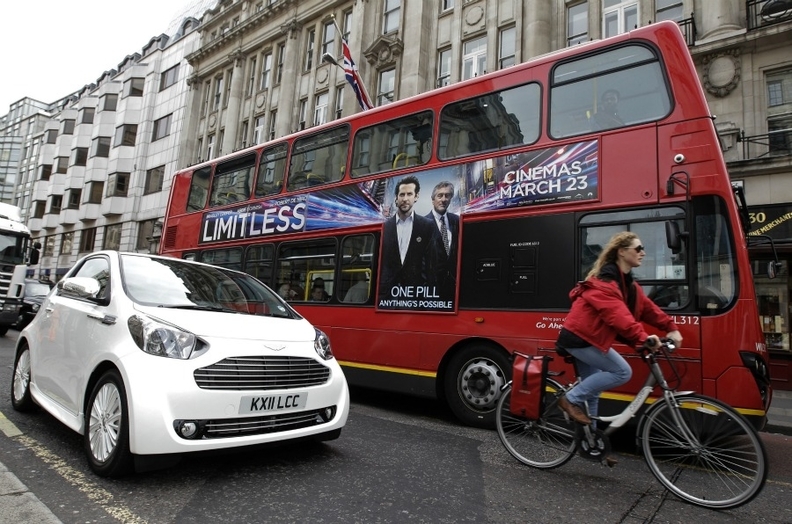 The Cygnet also gives Aston Martin a less-polluting option, which provides buyers with a "green halo," said Peter Schmidt, managing director of Warwick, England-based Automotive Industry Data. The compact emits about 120 grams of carbon dioxide per kilometer compared to 572 grams for the One-77. Aston Martin says the car was built for customers rather than regulators. The company has received 400 orders for the car and will sell the Cygnet to newcomers and current customers in the United States, Asia and Europe. "The attitude of the super-rich has changed," Schmidt said. "They really do want to be seen to be green. People can turn up at their golf club in this car and it will be a talking point, and Aston Martin owners love talking about their cars."